UWGB alumnus – and Future 15 recipient – Vanya Koepke is in the running to receive this year’s Young Professional Award. It’s a prestigious award that honors an individual who shows pure commitment to the community. Vanya is a board member on the UWGB Alumni Board, serves on the board of Howe Community Resource Center and is chairman of the Green Bay Chamber’s Current Ambassadors. Through these roles he is able to impact the community in many positive ways. For example, he assists with scholarship fundraisers and hosts events such as “Rock the Resch” and “Krash the Kress.” He helps the Alumni Association with its annual golf scholarship outing and personally donates to the UWGB foundation. Vanya loves giving back to the community and helping residents. His position on the board of the Howe Community Resource Center enables him to create fundraisers for families in need and host after-school events for kids. Through his work as a Current Ambassador, he’s been able to advocate for development projects in Green Bay. “I have also worked to grow engagement with recent graduates ranging from networking, to involvement and ultimately, job placement,” he said. His passions have led him to run for Green Bay City Council in next week’s election; April 3. His parents adopted him from Russia 15 years ago – which inspired him to run for office and give back to the community. “I am running to bring a fresh perspective and fresh ideas to local government,” says Vanya. Vanya Koepke is just one finalist for the Young Professional Award. Also in the running are fellow UWGB alumni Miranda Bonde, Sarah Beckman, and Jennifer Jones (who is currently employed at UWGB). 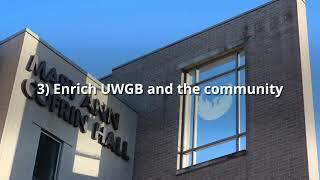 UWGB Employees Mai J. Lo Lee and Laura Rowell are also up for the award. Winners will be announced on April 26th at the Fire and Ice Gala at the KI Center hosted by the Greater Green Bay Chamber of Commerce. Vanya, Miranda, Sarah, Jennifer, Mai and Laura are reflections of what UWGB hopes for all its students. GOOD LUCK! The group Public Media consists of: Katie Flanigan, Katie Pozorski, Trey Pingel and Emily Kelly. Previous Post - Previous post: Crisis Averted? Good Luck ALL ‘GB People! This was a great story to write and Vanya is a great person to interview. Good luck Vanya on everything you do!